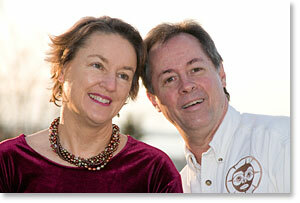 Sheehan World Archive Edition: Kathy Sheehan and Chuck Dingee: Still In Love. BELLINGHAM, WA (February 2008) -- Five thousand days! Sheehan World publisher Kathy Sheehan is celebrating several wedding anniversaries this month -- but only with one husband. Sheehan and her soul mate, Walrus vocalist, guitarist and sax player Chuck Dingée, are still pathetically in love, and Kathy keeps track of how long they've been married like a true Virgo. "People roll their eyes when we announce we're celebrating another Saturday anniversary," Sheehan said. "Or when I pull out my Palm Pilot to calculate the number of days we've been married." "Oh, pulease!" Dingée responded. "They don't roll their eyes. They gag!" "They're just jealous," Sheehan retorted. Sheehan and Dingée, two Virgos who fight over alphabetizing whether the items in the dishwasher and the spice rack should be alphabetized, were married in Philadelphia in 1994. After a Quaker ceremony and a reception at the Philadelphia Maritime Museum, the bride left on a cross-country "honeymoon" with the Haole Boys. Avid SCRABBLE players, sailors and mushroom hunters, the serendipitous lovers who often find meaning in numbers, said they would celebrate their 5,000-day anniversary during the week of Valentine's Day, and through Volume 14, Number 2, of The SheehanWorld. February is for these lovers. The Sheehan World is the world's leading online newspaper for all things important in Kathy Sheehan's world and has been in continuous circulation since 1995.